While we were on our latest trip, we had APRS running on my ham radio and it captured our route. 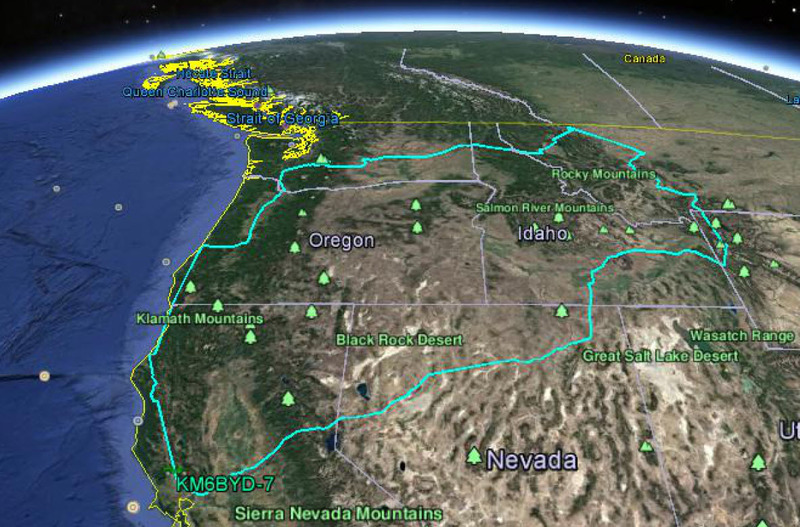 Here is a picture of the route thanks to Google Earth. On our trip, we logged just over 3000 miles pulling the trailer. So far, we have logged just over 12,000 miles with the trailer since we got it last May. We left Grand Teton National Park this morning and started our three-day trip back home. But we knew we had one more place to visit that was almost on the way: Craters of the Moon National Monument. It is in southern Idaho, the only national park/monument in Idaho. And it was lots of fun. If you know us, you know that we like to visit things natural, especially those that involve geology. Craters of the Moon is an area that is full of a variety of volcanic features like lava flows, cinder cones, and spatter things. This area used to be on top of the very same hotspot that is now under Yellowstone. As time (in millions of years) has gone on, the hotspot has stayed in the same place but the continental crust (our land mass) has moved across it so that the hotspot has bubbled to the surface across a large arc of the US. This was kind of a lazy day for us. In the morning, we went to the Jenny Lake Overlook and hiked down the trail along the lakeshore to the Jenny Lake campground and back. On this trail, you get a great view of the lake and the mountains that rise right up from it. In fact, you are so close to them that you can't see the top of Grand Teton as it is hidden behind the closer peak on the way up to Grand Teton's summit. Grand Teton National Park is a great place to see fabulous mountain peaks and lakes. It doesn't have the range of short hikes we like to take these days but has lots of longer hikes, so it is not as great a place for a longer time. We are here for two more days so we decided to take a leisurely time going around the driving tour. Today, the skies were much nicer. Although there were some clouds at the peaks, we were able to occasionally see clear to the top of Grand Teton as well as other peaks. Our time in Yellowstone National Park was almost up. Today, we are driving from Yellowstone to Grand Teton National Park, a leisurely 64 miles from our campsite in Yellowstone to our campsite in Grand Teton. We stopped at West Thumb Geyser Basin as we departed from Yellowstone. Although it is small compared to the other geyser basins in Yellowstone, it is really nice. It is right on the shore of Yellowstone Lake, which became more understandable once we learned how the West Thumb bay on Yellowstone Lake was formed. The lake itself was formed by glacier but West Thumb was a separate, much later caldera from a collapsed volcano, and is much deeper than the rest of the lake. So you are where you might expect a hotspot to be, and you would be right. We arrived last night in Yellowstone NP after a very long day of driving. We drove 487 miles in 10 hours to go from Glacier NP to Yellowstone NP. We try to drive no more than 400 miles in a day, but we didn't want to spend an extra day traveling for 87 miles, so we made it through the long day. We decided to start by going directly to Old Faithful and see Old Faithful, of course, and some of the other geothermal activity in the area. There is a lot of it. In addition to Old Faithful, which we saw erupt twice, we walked through Geyser Hill and its many features, and after a bit of a walk, we walked back to the village area to have lunch and go back to camp.